Crossroads Campus Ministry- Mankato | Progressive. Inclusive. Authentic. Community Group meets Wednesday, 6:30 PM. Crossroads Campus Center, 331 Dillon. Students, non-students, neighbors welcome. Some people think becoming a person of faith means having it all figured out. Others imagine God ought to work like a piece of binary computer code. One thing or another, not both. On Wednesdays you won’t get glib answers, you’ll search for your own in the company of other searchers. We’re using the Gospel of Luke as a jumping off point. Loaner Bibles provided. If you want to get your own, look for a New Revised Standard Version (NRSV). Or whatever one you have. You can do this. It’s just conversation. Not sure about God? No worries! Even life-long Christian have periods when the God concept seems too far-fetched to be real. That includes the leader of this Community Bible Study. The first-ever indoor Farmer’s Market happened at the beginning of 2nd Semester. 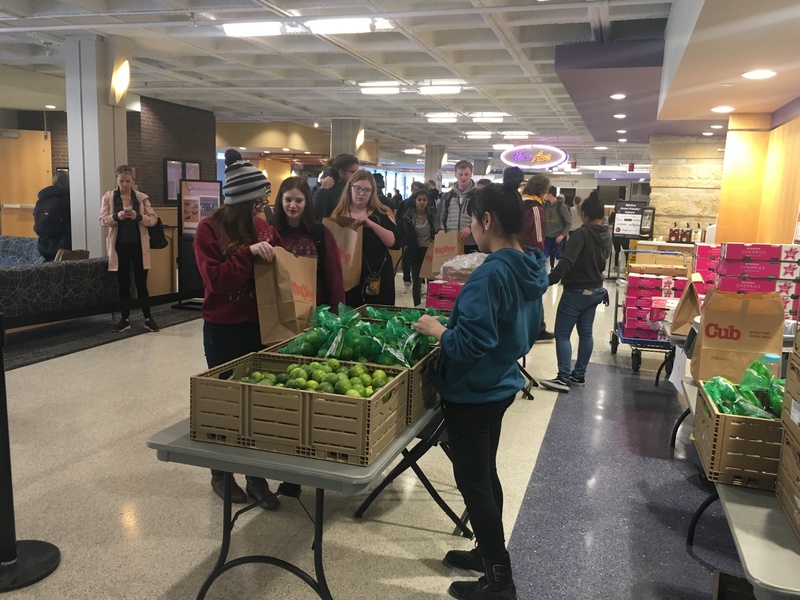 More than 800 students filled grocery bags with fresh cucumbers, apples, onions, cherries, kiwi, potatoes, and more, selecting from the tables spread out in the Centennial Student Union. Campus Cupboard’s Coordinator, Gail Fox, coordinated the delivery of food to Centennial Student Union with Karen Anderson who manages Campus Kitchen, our partner in serving hungry students. Jesus had some astonishing drop-the-mic moments. With a couple of words, he changed everyone who heard with an open heart. Come Wednesday nights at 8:00 PM to hear more. Is this for me? Crossroads serves the whole Minnesota State University–Mankato community. You don’t need any special beliefs, or viewpoint, or even a church background at all. Our pastor doesn’t judge anyone for having questions or doubts. She says she has plenty of her own! Pastor Heather likes to say Crossroads is a place that welcomes all people of good will, NO EXCEPTIONS. Crossroads is the only Reconciling in Christ campus ministry at MSU. That means we are serious about keeping this a safe and hospitable place for everyone. A blessing scarf is a handmade scarf, knitted or crocheted, given to a member of the wider University community who is going through a rough patch. One has gone to a young woman whose dad died suddenly. Another went to the spouse of a faculty member facing cancer. Yarn and instruction provided–and knitting needles are available to borrow. Click the Donate link to donate to Crossroads Lutheran Campus Ministry using PayPal. All donations are tax deductible.